Clearly defined values keep us grounded. Identifying your business’ core values – your most important rules of personal conduct and corporate responsibility – is a critical step for building a strong company culture. Core values are what you hold sacred as your “Business 10 Commandments.” They are the principles that guide your decision making. Just as your vision and purpose are unique to you, so are your core values. While some values, such as integrity and respect, are universal, it is up to you to define and deliver these concepts in words, actions, and results. Respect – We exhibit respect by carefully choosing and working with right-fit clients, employees and partners, which allows us to deliver world-class results. Investing – We improve our own results and those of our clients by consistently investing in our internal planning, processes and people. 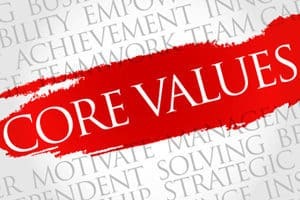 Good decisions and consistently positive results derive from having core values (and defined goals for living those values) that are relevant in each of the significant areas of your business—strategy, planning, marketing, sales, operations, sustainable practices, leadership, culture, human resources, and finances. These core values are the big picture parameters of your business. Policies, processes, and procedures outlined in employee handbooks and documented throughout your company as best practices are the tactical representation of your core values. Contact me if you are interested in learning more about creating your own Business Core Values.